What to do for exercise when the weather turns cold and rainy or snowy? Head to your local mall, of course, which is especially nice when that mall allows dogs! 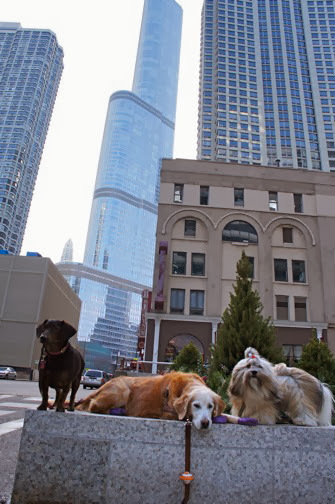 Last week when Rocco and I were in Chicago, we had another lovely meetup with Sugar Golden Woofs and Dolly the Doxie, and their humans too! The Shops at North Bridge on Michigan Avenue is completely dog friendly, so even when it's cold or wet outside, you can still go for a nice dog-walk, getting in some good exercise for both of you and maybe a new pair of shoes too! Our first stop was Nordstrom where we received a red-carpet welcome! It turned out they were having a VIP event complete with Mimosas, coffee and yummy mini breakfast snacks. We spent some time getting fortified by the snacks and shoes before heading off for a walk about the mall! Next we set out to walk throughout the entire mall. It wasn't exactly a brisk walk as many folks stopped to talk to us, but we covered a lot of ground on each of the mall's four levels. We stopped briefly to admire the mall decorations and then headed outside for a walk down Michigan Avenue. But first, we stopped for one more photo shoot! Sugar's mom took this photo and you can find more about our outing from Sugar here. Look! It's the Tin Man! Then we walked down Michigan Avenue and looked at all the pretty holiday decorations! After our walk, Dolly's mom took this pretty picture in front of the Christmas Tree. We had a great time visiting with our pals and taking a nice walk too. 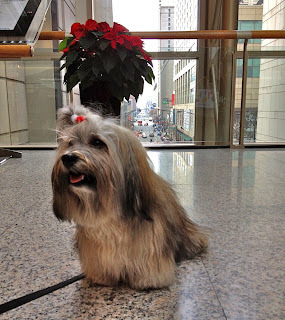 Are there malls in your area that allow dogs? We've been in lots of dog-friendly stores, but this was the first I've learned of that allows dogs throughout the entire mall. Ah, shoe shopping, figured that's where you girls would hang out...shopping is good exercise though! Wait...Rocco - you're NOT a girl - what are you doing in the shoe section of Nordstroms! hehe! I'm a smart doggy! I'm hanging out where the girls are! We do shopping for exercise all the time! But I had never thought of it as fit dog time. Thanks for the excuse to shop more.. I think. We love chasing the ball up and down stairs on the odd occasion when we can go out or deading a plastic plant pot. Such fun. The majority of the boutiques here seem to allow small dogs (some want you to carry them). None of the malls here officially let dogs in. Mom says, oh no, the dreaded mall walkers! Here in MN it is a huge winter sport and mainly older folks. It makes lots of trouble for anyone just shopping as they really take over the mall certain times of the week. We also have skyway walkers in the downtown area, mainly at lunchtime. As long as people are moving it is a good thing but most indoor places don't allow dogs. Gee, I don't ever remember being to a mall...and even if we did have dog friendly ones, it's too hot in the southeastern U.S. to travel far with a dog, especially to a mall. My Human says the ones she's been to are mostly open, no roof or only over parts of it, so no air conditioning. Maybe I can convince them to take me to visit y'all in Chicago! You think? You'd love Chicago! We love playing on the beach at Lake Michigan too. I bet you'd like that! What a great way to get some exercise indoors when the weather is cold! I'm not sure there are any malls in Florida that allow dogs to walk everywhere. I guess we should check that out! So glad you all had a great time together! Our mall is not dog friendly. I do go but its only because I am a working girl. It does look like you all had a lot of fun. Ma says we may be headed to Chicago this summer. We will be visiting the museums and such. Sissy Sarah has been wanting to go so it may be around April for her birthday. I love these pictures! A dog friendly mall, that is soooo coool. Did Sugar buy some new purple shoes at the shoe store? I'm glad you six got together, it sure looks like a wonderful place to meet up. Sugar found a whole wall full of purple Ugg boots! There's a photo on her site... link to it is in the post above! We had a blast! Wow, what a lucky find! We have an outdoor pedestrian mall that doesn't even allow dogs. What's the sense in that? 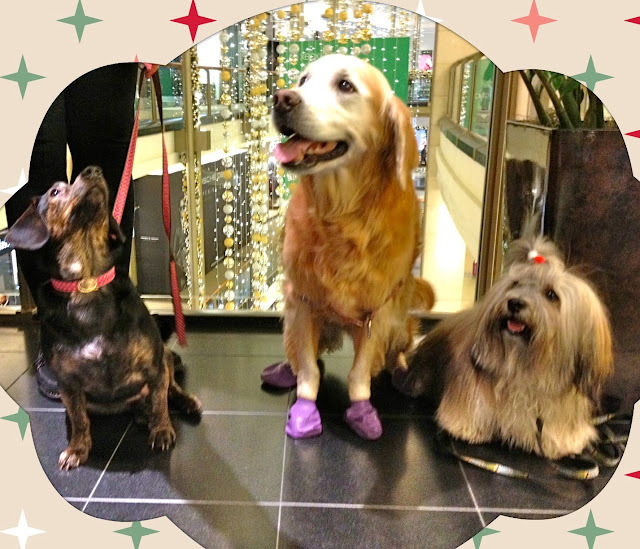 Our indoor shopping mall has two days a year that are open to dogs. Unfortunately, without a car, it's a long bike ride up a big hill. But then again, it would be a good activity for Fit Dog Friday. What a great post! Nothing like that near us down here in Melbourne, Australia. Love the fact that dogs are allowed and actually welcomed!! ohhh looks like a great time. I never heard of any malls allowing dogs so what a great way to keep fit. I wanted to see what you guys bought :) I don't think any of our malls around here are dog-friendly (well, one outdoor-village mall is but that doesn't help in the rain). I remember taking Chester to one once. We were just hanging out on the sidewalk by the door and some 15 year old security kid threatened to call the police if I didn't leave because I was "trespassing with my dog". 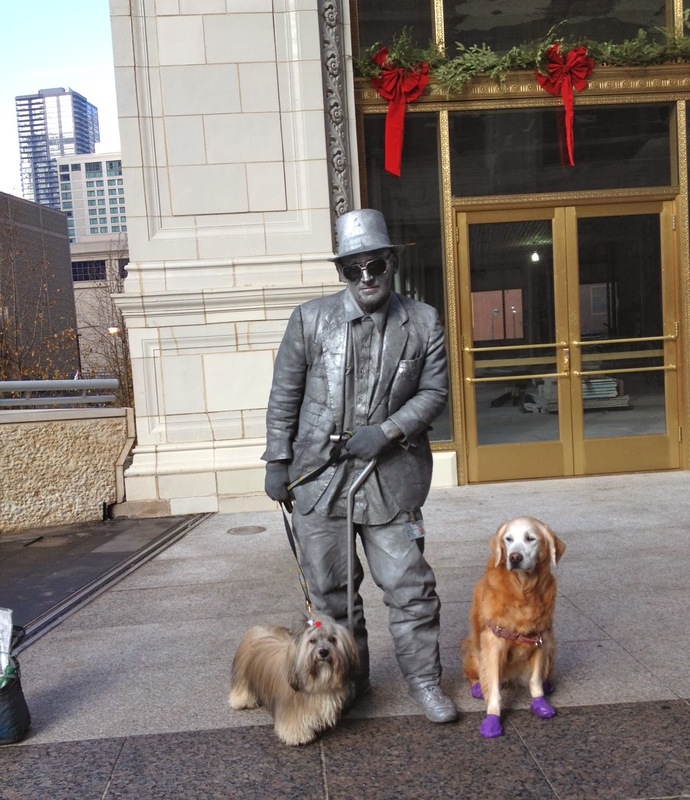 How fun- pretty cold in Chicago- so great they are dog friendly- here not so much in our malls. so fun that you get to hang out with your fellow bloggy friends! 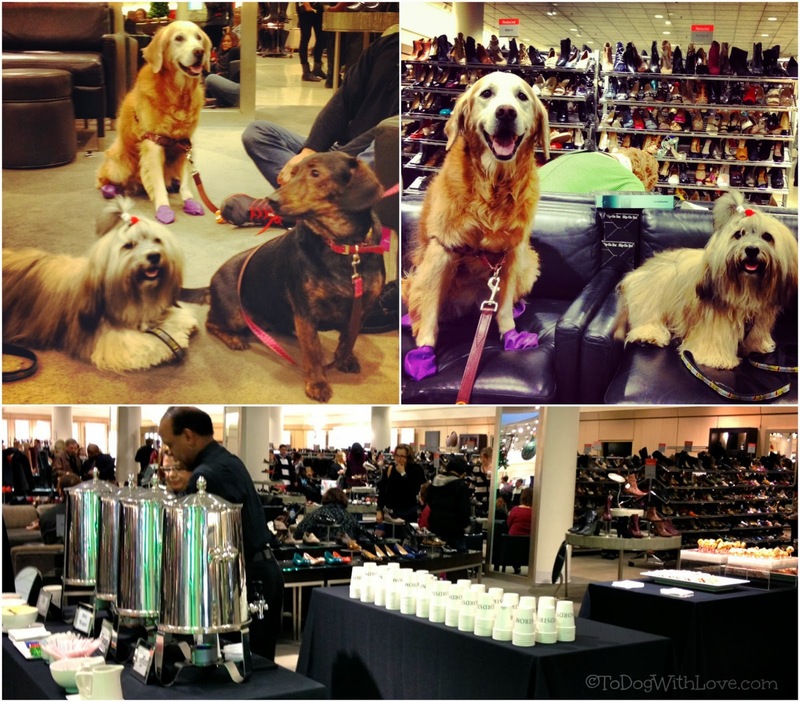 Wow, mall dogs, red carpet, mimosas, you've got it made! And thank you for sharing on the Pet Parade! Hope you come by tomorrow for another week of fun!